A new telescope attachment allows much greater precision in observing exoplanets—planets beyond our solar system—from Earth. With the new attachment, ground-based telescopes can produce measurements of light intensity that rival the highest quality photometric observations from space. The custom “beam-shaping” diffusers—carefully structured micro-optic devices that spread incoming light across an image—are capable of minimizing distortions from the Earth’s atmosphere that can reduce the precision of ground-based observations. 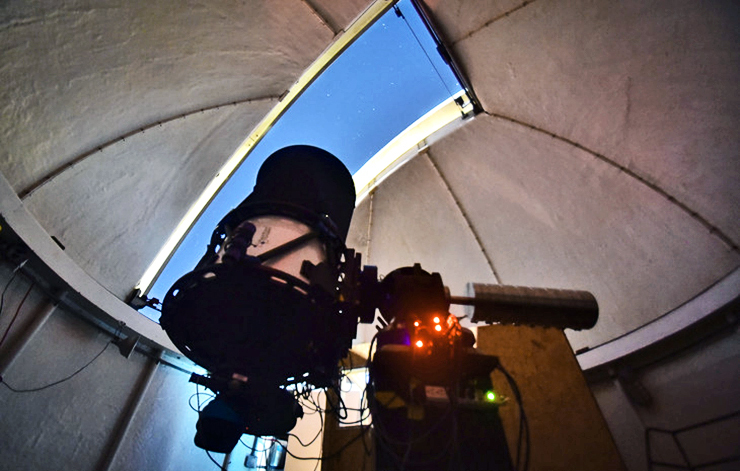 The research team tested the new diffuser technology “on-sky” on the Hale telescope at Palomar Observatory in California, the 0.6m telescope at Davey Lab Observatory at Penn State, and the ARC 3.5m telescope at the Apache Point Observatory in New Mexico. In all cases, images produced with a diffuser were consistently more stable than those using conventional methods—they maintained a relatively consistent size, shape, and intensity, which is integral in achieving highly precise measurements. Using a focused telescope without a diffuser produced images that fluctuate in size and intensity. A common method of “defocusing” the telescope—deliberately taking the image out of focus to spread out light—yielded higher photometric precision than focused observations, but still created images that fluctuated in size and intensity. “Diffused observations are by far the most stable,” says Ming Zhao, a data scientist at the New York Times and former research associate at the university who led the diffuser effort at the 5m Hale telescope at Palomar. By shaping the output of light, the diffuser allows astronomers to overcome noise created by the Earth’s atmosphere. “The stable and smooth images delivered by diffusers are essential in minimizing the adverse effects of the turbulent atmosphere on our measurements, and in maximizing our precision,” says Zhao. The research team is already establishing collaborations to implement this technology on other telescopes around the world. “Our goal is to equip the broader exoplanet community with low-cost precision tools to deliver precise measurements to aid future observations in exoplanet science,” says Stefansson. Additional researchers contributing to the work are from Hobart and William Smith Colleges; the University of Oklahoma; the University of Washington; the University of Pennsylvania; the California Institute of Technology; the University of Arizona; and the Apache Point Observatory. A Scialog grant from the Research Corporation for Science Advancement (Rescorp) and supported by the Center for Exoplanets and Habitable Worlds, a Leifur Eiriksson Foundation Scholarship, the NASA Earth and Space Science Fellowship Program, the National Science Foundation, and the Penn State Astrobiology Research Center funded this research. A paper describing the effectiveness of the diffusers appears online on in the Astrophysical Journal.